Death is deeply embedded in the social fabric of what we experience on an everyday basis as “life.” Inscribed in death studies, the present volume takes a cultural-sociological perspective and asks how our knowledge about death and dying emerges through concrete personal experience, but also how it draws on culturally shared narratives and how it relates to broader societal conditions and events. 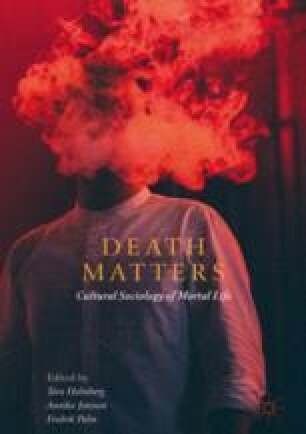 Death matters in terms of being the object of discursive and material cultural practice that makes it matter in different ways. And there is something about the materiality of death that escapes such practice and for this very reason becomes constitutive of social everyday life, in short, of mortal life. This chapter develops this argument, drawing on classical as well as contemporary studies. We then end the introduction with an outline of the three parts of the book—places of absence-presence, Disease/bodies, and Persons and non-persons—and the studies included in them.